SD Card Reader Port: Supports SD, SDHC, SDXC, MMCII/RS MMC/Ultrail SD/ Extreme SD/ Extreme III SD, Mini SD/ MMc micro/ Micro SD MS slot. USB 2.0 Port*3: Supports external hard drives, USB sticks, mouse, keyboard,U disk, USB lamp, USB headset etc. Backward compatible with USB 2.0 / 1.1, up to 480Mbps. Compatible with almost any System, Mac OS X, Windows10/8.1/8/7, Vista, XP, Linux etc. And part of other device with USB C port. 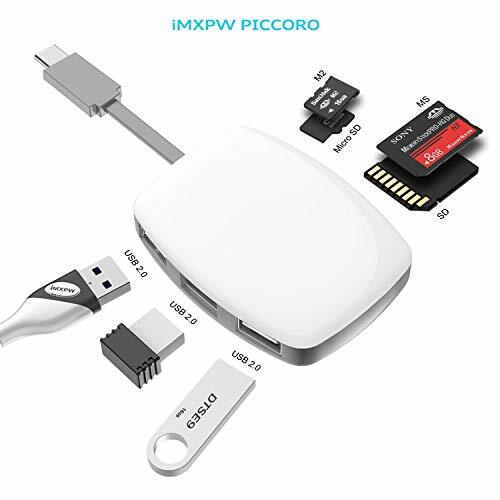 1.Only one memory card can be used at a time, although iMXPW PICCORO facilitates the reading/writing from 4 different memory card ports. 2. Memory card slots can read memory card with max 256GB. So SDXC card read has a limit of only 256GB. 3. A single USB 2.0 port does not support any USB device drawing over 500mA current. And total support for 3 USB ports is 2A. 4. It does not support CF/XD Card Powered by USB port. 7-IN-1 Memory Card Reader - iMXPW USB Card Reader Hub has 4 card readers and 3 USB 2.0 ports. Helps you to avoid the hassle of carrying many card readers and allows you to easily transfer photos, music, data with a single iMXPW PICCORO Digital Memory Card Reader. *Note: This Multiple card reader can read only one Memory Card at a time but can operate all the 3 USB ports simultaneously. Type-C connector - iMXPW 4-slot Memory card reader Combo Adapter comes with a USB Type C cable connector. Compatible with MacBooks, laptops, PCs, smart phones, tablets and many more devices having a USB C port. USB 2.0 Port with OTG Support- iMXPW Multi-Card Reader has hot swappable USB ports that support many USB peripherals with USB 2.0 and OTG. It is backward compatible with USB1.1 Note: Supports memory devices with maximum 2TB and does not support USB devices over 900mA current. Technical Superiority - iMXPW Digital Camera Reader Adapter is low energy consuming, portable, multifunctional plug and play multi-card reader. It is bus-powered and so no need for external power supply. The attached connector cable can be fitted seamlessly back into the body to fit ergonomically in your palm or pocket. Its built for universal compatibility for Windows, Mac, Android and Linux OS. Safety First & 18-Month Warranty - iMXPW 7 IN 1 Digital Memory Card Reader comes with a 30-day return promise and 18-month warranty for quality-related issues, lifetime technical support, and friendly customer service. This multi-card reader has a buit-in safety feature to prevent over heating due to voltage fluctuations.